The Converse Blog: Dominic James' search for employment. I love sports drafts, fantasy football drafts, and rough drafts. For fans of sports drafts, June is the most wonderful time of the year. In June you have the MLB, NHL, and NBA drafts. While I enjoyed watching the MLB draft and I look forward to the NHL draft, it's all about the NBA draft for me. When I was younger I would tape each draft and I would write down all of the information about each player drafted. I would then take the relevant information and create all of the new players on NBA Live. I didn't care that a new game would be coming out a few months later, I wanted the new players right then. I also love that you never know what's going to happen. Who is going to be picked sooner or later than they were projected? Who is going to be traded? Will this guy ever actually play in the league? But more than anything else I've always enjoyed seeing people advance to the next level of their profession. Which brings me to a little bit of a personal matter that I want to share with you all. After spending a year in the D-League, also known as substitute teaching, yesterday I accepted a 6th grade teaching position here in Corbin. It's safe to say that I am freaking out a little bit. However, I am very excited to take on this new challenge and take my "game" to the next level. I am extremely grateful for the opportunity that I've been given. I was fortunate enough to beat out 65 other applicants to win the position and I give God all the thanks for this new opportunity. 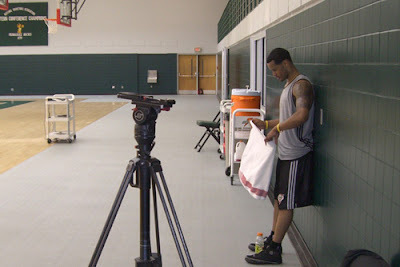 Which brings me to today's post, Dominic James has had one workout for the upcoming NBA draft. 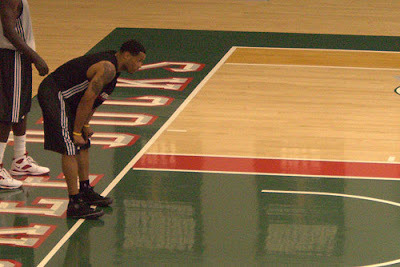 James, the senior guard from Marquette, almost came out for the draft after his sophomore year but returned for two more years. Unfortunately, he broke a bone in his foot and missed significant time in his Senior year. No doubt that his draft chances would be better had the injury not happened. Never the less he is going strong trying to convince one of the NBA teams to select him in the draft. Thanks for checking out the blog, I haven't gotten to the new poll yet though. As you can probably imagine it's been pretty crazy around here the last few days. Look for that soon, along with a new Friday Flashback tomorrow!